The Women in Science and Technology program is excited to announce the return of TWIST (Tours of the Women in Science and Technology program) for 2014 with new co-organizers Natalia Saraeva (NE) and Raymond Patchak (ESQ). TWIST grew out of the laboratory facility tours offered to high school girls at the annual Science Careers in Search of Women Conference. Beginning in 2012, WIST members Ja-Quel Bullock (MCS) and Lydia Finney (XSD) recognized the value and popularity of these student tours, and co-founded the tour series so that everyone in the lab could have opportunities to learn about the exciting research being done here. TWIST tours are thus open to all lab employees whether student or senior scientist, male or female, non-technical or researcher. Lydia Finney emphasized how the tours not only give attendees a chance to see the lab, but also the opportunity to network with people from across divisions. Each tour incorporates a time for refreshments when employees can meet, talk, and ideally even realize the potential for scientific collaboration. 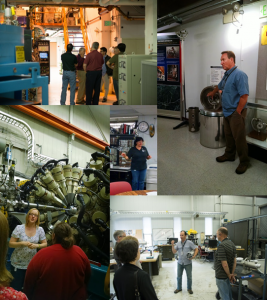 Previous years’ tours have explored the Center for Nanoscale Materials, the Advanced Powertrain Research Facility, the Nuclear Energy Exhibit, the Sub-Angstrom Microscopy and Microanalysis facility, and the Advanced Photon Source. The first tour in the 2014 TWIST series took place on Wednesday, September 10th, and showcased the Argonne Tandem Linac Accelerator System (ATLAS) facility, not to be confused with the ATLAS detector at CERN!